Welcome to Best Book Ever on Short and Sweet Reviews! Each week we take a different topic and readers, authors, and bloggers talk about what their favorite is for that theme. 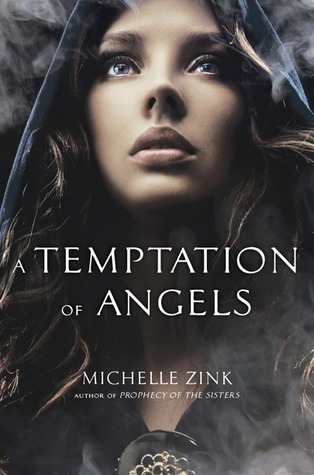 Since I know that the Infernal Devices series is an obvious choice- I am going to go the non-obvious route and pick a book that I was blessed to recieve an ARC of- A Temptation of Angels by Michelle Zink. I didn't expect this to have a steampunk edge to it. I really expected it to be a traditional YA angel book. It completely surprised me! A Temptation of Angels is a fantastic book and a wonderful start to a new series. This week is easy, since I haven’t read many steampunk novels, at least according to my own narrow definition of it. The term is flung about freely these days to describe stories that include steam-based technology and/or the wonderfully complex machines that result from it, or perhaps just a Victorian-ish fashion aesthetic—but the props are only some of the elements that characterize steampunk. For me, one of the key features is that the story takes place in an alternate history—what the world might have, could have, or should have been. Few gaze wistfully at the grim world of Cherie Priest’s Boneshaker, but “the Clockwork Century” is a great place to visit…safely, from the pages of her books. And what a book! To judge Boneshaker, the first installment of four stories currently in the Clockwork Century, by its amazing cover for a moment, there are a few things that immediately caught my eye. The first is, of course, the striking image of Briar Wilkes, suitably outfitted with shiny brass goggles that stand out against the muted colors. There’s a compelling recommendation from Scott Westerfeld, himself a master of the sub-genre. Oh, is that an airship reflected in one of the lenses? Hell yes, it is! And finally, but significantly, there’s Cherie Priest’s name—the main reason I picked this one up, on the strength of her preceding books. 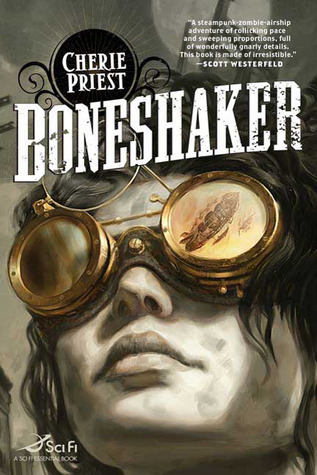 Boneshaker fully delivers on the promise of its cover, and then some. What you don’t see in Jon Foster’s evocative art is the intriguing setting that inspired it—an 1880 Seattle where a section of the city has been walled in…to keep the zombies in. Steampunk zombies! In Seattle! If that isn’t enough to pull you in, the book also has mystery, mayhem, and relentless adventure, as well as engaging protagonists, Briar and her son Ezekiel, who ensure there’s plenty here for readers both young and adult. Check it out. 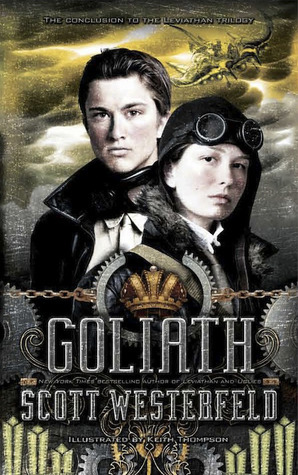 While I'm really enjoying Cassandra Clare's Infernal Devices series, my favorite steampunk book comes from my most favorite steampunk series: Goliath, book three in Scott Westerfeld's Leviathan trilogy. Westerfeld's integration of an alternate history is fascinating, -- I was thirsty for this series from the first time I saw the trailer for book one: http://youtu.be/PYiw5vkQFPw. And from page one of Leviathan I was totally swept up in the clashes between the Darwinists and the Clankers. But, more than the fancy beasties and deadly machines, it's the characters that make these books fantastic. Deryn is on my top ten list of favorite heroines. The best example of steampunk, to me, is Android Karenina by Leo Tolstoy & Ben Winters. I was debating between this one and Airborn by Kenneth Oppel, but decided to go the Android route because I don't think many people are aware of it. Yes, it's Russian literature - and I know that I'm in the minority and there aren't many who willingly pick up huge Russian novels for fun. 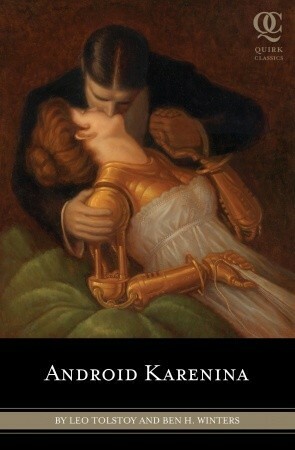 But Android Karenina is not your typical Russian novel: it's got robots. Robots! And all kinds of really cool techno-things, while still maintaining the sense of society and class that is present in the original. (It's also a LOT shorter. Just sayin'). The story itself obviously had to adjust to accommodate the addition of robots and etc, but to me, it worked. There are some zany twists and turns that you don't see coming, and the characters are more appealing in this variation than in the original (I read them both of my own free will, so I can make the comparison). Definitely worth a shot. And I want to go to one of their balls and dance in the air! I feel like I'm cheating a little here, because this is the only book I've read that I think qualifies as steampunk, but it is a really amazing book. CLOCKWORK ANGEL by Cassandra Clare is definitely my pick for best steampunk. I love the characters. Tessa is strong and intelligent, and I was pulling for her the whole time. And of course Will and Jem are both intriguing and wonderful in their own way. I can't decide which one I love more. I can say, though that I love how much action and twists Cassandra Clare can fit into one book and make it work. Even people who didn't love the Mortal Instruments series should check this book out. It's probably my favorite of all her books. I haven't read a ton of steampunk books, but here's one I'm looking forward to: INNOCENT DARKNESS by Suzanne Lazear. It looks amazing, and isn't that a beautiful cover? She has sparkles! How can this not be amazing? 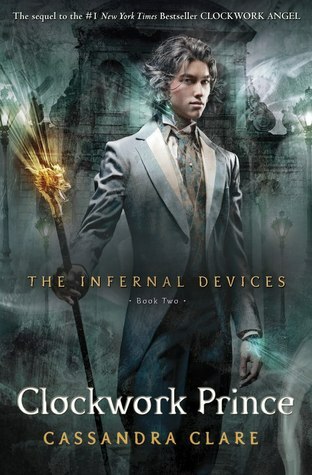 By far my favorite steampunk is The Infernal Devices series books 1 & 2, Clockwork Angel & Clockwork Prince. I mean, do I even need to list all the reasons why I love it? lol What's not to love? Cassandra Clare has done such a brilliant job at merging her Shadowhunter world with that of Victorian London. I can't believe I'm going to say this, but I may even love this series more than the TMI series *gasp*, don't tell Jace that. He's of course my second favorite series. There's just something about Cassie's writing and her world building that I can't get enough of. I'm fascinating by this genre and this series as a whole. I mean there's Jem, Tessa, Will, and Magnus, plus this entire setting that's completely fascinating, mixed in with romance, action, heartbreak, betrayal, automatons, paranormal elements, and so much more. How could I not love this.... this series has it all. Clockwork Angel by Cassandra Clare is by far my favorite steampunk! Wow! It blends the fantastical with the historical in this action-packed novel! Cassandra's crisp writing style and her stunning, flawless attention to detail are superb, and enhance the atmosphere of the story! Not only is it action-packed with sizzling romance, the world building is masterful. The signs of a true pro are in this first installment of a seriously epic trilogy! The only steampunk novel I've ever read is Clockwork Angel by Cassandra Clare and it was AMAZING. I loved Clare's Mortal Instruments series, so when I ended up reading Clockwork Angel I wasn't even aware of the fact that it's steampunk. However, it was such a pleasant surprise! Up until a month or so ago, I was walking around thinking I had never read a steampunk novel in my life when someone told me that CA is steampunk! 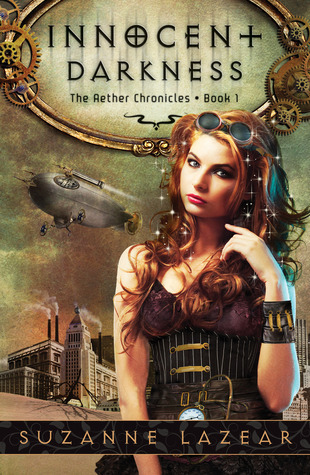 Now, I'm dying to get my hands on anything steampunk and I look into a lot more steampunk titles! If you haven't read CA yet, I definitely recommend you do. It's filled with mystery, romance, and tons of action! 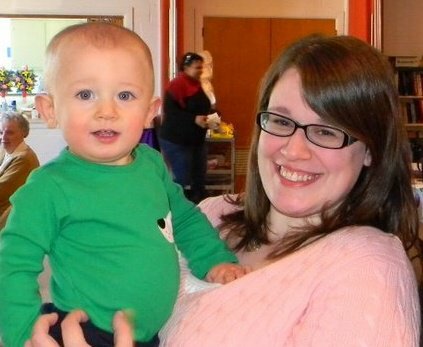 Ok, since noone picked it- I am sneaking in with a second pick (oh hush you! It is my blog! ) 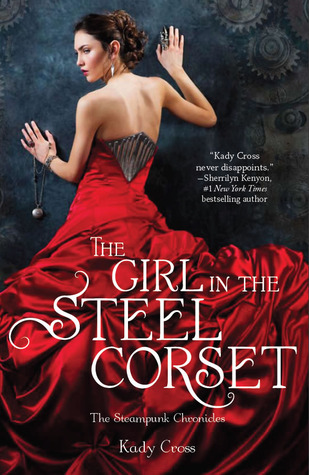 Have you read Kady Cross' wonderful The Girl in the Steel Corset. I want to LIVE in that book- it is so incredibly awesome. The story is phenomenal and it is based on some great literary characters (you will have to read it to find out who). The sequel Girl in the Clockwork Collar comes out this year! We hope you enjoyed this week's Best Book Ever. If you want to talk about our picks, or suggest a title we missed below- we would love to chat! Our blog now has an awesome "reply" feature, where we can actually have a conversation in the comments! Ps- If you are a blogger, author, or a book lover and you want to be featured in any of our future Best Book Ever features- email us at oneminutebooks at gmail dot com! I loved how Clockwork Angel & Clockwork Prince were mentioned like 4 times xD I have recenlt read Dearly, Departed & LOVED it so I'm definitely gonna try more steampunk! Some great picks listed here. I loved Clockwork Angel and have Clockwork Prince here to devour as well. Oh, gosh, if I had found the time this week I would have contributed to BBE with a blurb about THE GOLDEN COMPASS, which I think counts as steampunk and is one of my all-time favorite books ever. I was so engrossed in it on the way to my brother's wedding reception that my family had to forcibly make me leave it in the car when we arrived. 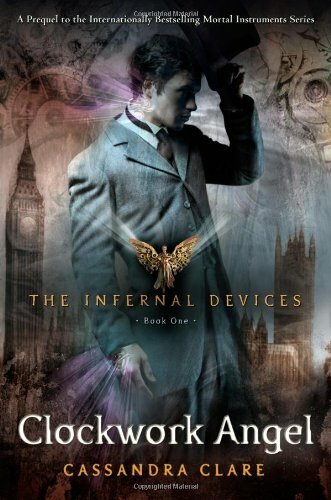 The Infernal devices was great Steampunk but I think the Girl in the Steel corset wins! I loved the book so much! The characters were great and the story was truly amazing! Can't wait for the Girl in the Clockwork Collar!